I've gone overboard crazy about whitening soaps in the past that I've completely ignored the power of a good anti-bacterial soap. After all, flawless, fair skin must not just be white but also clean and germ-free-- protected from harmful agents that may cause irritation that will harbor ugly marks and rashes. Just recently, I started incorporating two anti-bacterial soaps in my skin primping regimen: Leading Brand (white variant) and Shield Cleansing White. I've been using both for weeks now and I see no reason not making either of them a bath mainstay. Its label says that it has been proven effective in removing skin germs that may cause skin infection and perspiration odor. 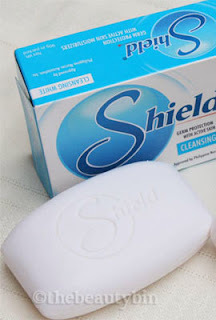 Label says: "Shield is formulated with an anti-bacterial ingredient that provides a long lasting protection against skin bacteria that may cause disease and body odor. It is also infused with active skin moisturizers (she butter) that help maintain the skin's natural moisture while cleansing." I'm not a newbie to germicidal bath soaps but the experience using these two turned out to be an exciting one. 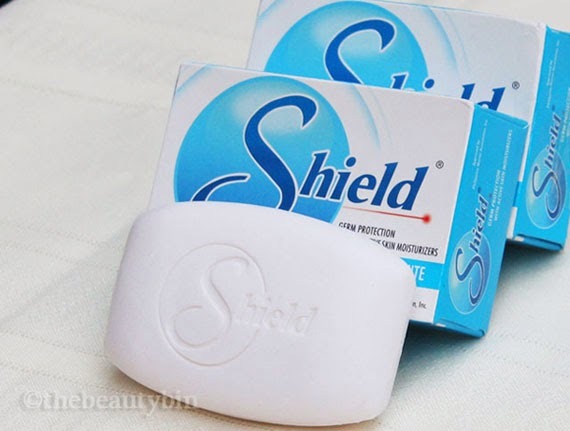 Both Shield and the Leading Brand leaves a just-got-off-the-shower scent that I've never experienced when solely using a whitening soap. What's more, that feeling of freshness lingers for hours which can be empowering-- the cleaner I feel, the more confident I am! Shield Cleansing White may seem to have a winning edge over the Leading Brand (white variant) because of the active skin moisturizers it contains, but I found both to be equally moisturizing. Using either of the two gives my skin a smooth, soft feel. The big difference lies in the fragrance. Shield has a more striking fresh scent. It's also interesting that the Leading Brand lathers a bit more easily than Shield. Because of that, I ended up with a smaller bar of soap with Shield after using both soaps for two weeks. That may well explain why the Leading Brand is a few more pesos pricier. Before I was sent these soaps to try out, I suffered nasty flea bites from occasionally petting a neighborhood cat (lesson learned, please don't tell me I should've known better :( ). Our general physician prescribed an antibacterial liquid soap and an anti-itch cream, which actually worked. If I used my usual whitening soap alone, my bug bites would blister and leave huge, hideous marks. When the soaps came, I used Shield and the Leading Brand, in place of the liquid soap, using one bar after the other to isolate results. For a fraction of the liquid soap's price, these two worked surprisingly well! The stung areas no longer formed blisters hence, my marks looked a lot more acceptable as they healed. Antibacterial agents help in bug bites by minimizing infection to the affected area. Less infection means less inflammation ergo, less trauma to the skin. (If you ask where the infection would come from, it's from the environment and from scratching the itchy area as anti-itch creams are not foolproof). I will not hesitate to recommend these two affordable, very similar antibacterial soaps. Those who prefer a more toned-down refreshing scent will find the Leading Brand (white variant) more fitting while Shield is ideal for those who are on the go and would not want to fuss about spraying fragrance after bathing. They both leave the skin smooth and feeling fresh for hours and are genuinely effective germ-busters. Disclaimer: Products were sent to me for review purposes. Post contains my unbiased personal experience while using the two soaps, the Leading Brand (white variant) and Shield Cleansing White.